Leek's final away league fixture produced their highest score against the relegated Hornets but not before the…. ….home side earned themselves a well-deserved try bonus point for the first time this season. Fielding quite a changed side from last week, Jack Newton Taylor was accompanied by Joe Cooper and Ian Alcock in the back 3. Tom Scragg and Sam Hunt were in the centre. Ollie Drew and Isaac Reaney were at half back. Joe Newton Taylor, Ed Cheadle and Bobby Cheadle made up the front row. Ben Barlow and Lewis Dunleavy were at lock. Joel Booth at No.8 was flanked by Tom Fairhurst and Andy Thompson. On the bench were D J Allen, Matt Tanner and Andy Outram. On a glorious afternoon in Shropshire, with the pitch in great shape, Leek opened the scoring on 5 minutes from a catch and drive at the lineout on the left following an offside on Telford's 22. Ed Cheadle scored but Sam Hunt missed the conversion. 0-5. A clearance kick from Telford on 17 minutes was picked up on Leek's 10 metre line on the right and after good interpassing and support, the ball ended up with left wing Joe Cooper who managed to outsprint the final defender to score under the posts. Sam Hunt converted and Leek moved to 0-12. The kick off didn't go 10 metres and from the scrum Joel Booth picked up and one pass later Jack Newton Taylor was scoring Leek's 3rd try in the right corner. The conversion missed and Leek were 0-17 in front. Telford were next on the score board on 24 minutes after Leek kicked the ball away. Good hands, poor tackling and the centre scored on the left. The conversion was missed. 5-17. Joe Newton Taylor then scored Leek's 4th try and his 16th of the season from prop as he picked up from the ruck after a catch and drive at the lineout. Sam Hunt converted and Leek led 5-24 on 30 minutes. From the kick off, the impressive Tom Scragg took a pass and then went on a barn storming run to hand off tacklers and touch down on the right. (See attached photo of Tom touching down.) Hunt's conversion was unlucky as it hit the post and stayed out. 5-29 on 32 minutes. On 35 minutes, Telford ripped the ball off Leek and the intelligent kick from the fly half had Leek's defence unable to retain possession. The ball came out of the side of the ruck and the centre collected and scored under the posts. The conversion was good and Telford were up to 12-29. Leek did well then to contain Telford as the half closed out without further score. H/T 12 - 29. The kick off from Telford to start the 2nd half allowed Tom Scragg to go on another strong run and his pass to Joe Cooper on the right saw the wing score his 2nd try of the afternoon on 41 minutes. The conversion missed. 12-34. Leek scored again on 46 minutes, this time after showing patience in the tackle and rucks and then from a quick tapped penalty Jack Newton Taylor scored his 2nd try on the right. The conversion was good and Leek moved to 12-41. Back came Telford and the fly half made a break after a missed tackle and the pass to the left wing had Telford scoring their 3rd try on 52 minutes. The conversion missed. 17-41. A minute later and from a lineout on the left, Ollie Drew switched play back from the first ruck and Jack Newton Taylor stepped 2 defenders to score his 3rd try of the day. The conversion missed. 17-46. Telford could sense a bonus point and it nearly came on 62 minutes as they again stole a tackle ball. The fly half made another excellent break but a foot in touch prevented the score. 5 minutes later, Joel Booth went over for Leek's 9th try after a catch and drive at the lineout. The conversion was good and Leek extended the lead to 17-53. Not to be denied, Telford deserved their 4th try and after a near miss on 74 minutes, they did score on 76 minutes after persistent driving. The conversion missed but at 22-53, Telford had achieved their first try bonus point of the season. Just time for one more try and Leek's 10th, on 81 minutes with Jack Newton Taylor scoring his 4th on the left after good continuity from the scrum. ( See attached of Jack Newton Taylor on his way to scoring). The conversion was good from Sam Hunt and the game ended there with a 22-60 score line. Leek did what they had to do in a game without any contention for promotion. Telford will travel to league champions Ludlow for their last fixture in this division and we wish them well next season. 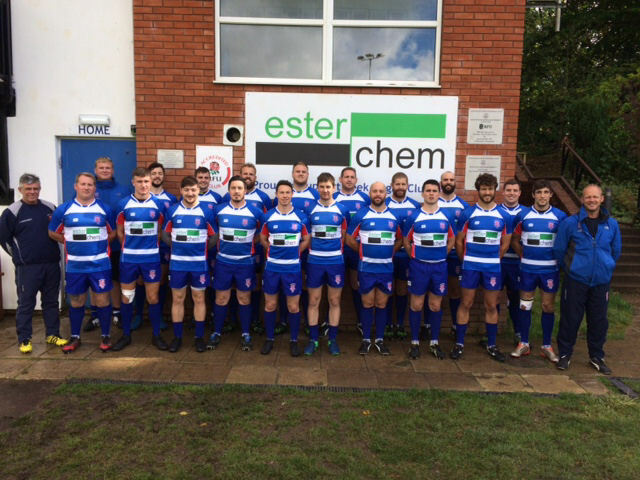 Leek could still play a part in the relegation battle as Stafford defeated Newcastle to move ahead of Veseyans by 2 points and it is Veseyans who travel to Esterchem Park this Saturday for the final league match of the season. Meanwhile Stafford travel to Spartans. At the top, Ludlow are champions despite their 4th defeat of the season at Tamworth. Tamworth's win wasn't quite enough to overhaul Wolverhampton in 2nd as they held their nerve to win at Spartans. Still Wolverhampton have to go to 4th placed Camp Hill for their final match as Tamworth visit Newcastle. It will be an interesting last day and everyone is welcome to see out the league season at Esterchem Park on Saturday.